Round Lake Senior High School 2011 graduate, U.S. Army Private Alexander Whiton has been named the Round Lake Area Exchange Club’s September Hometown Hero. State Representative Sandy Cole is the proud sponsor of this months hero. 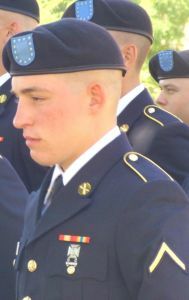 Whiton was registered for this honor by his father, Dennis Whiton of Gurnee. Whiton recently graduated from artillery school at Ft. Sill, Oklahoma and has earned the National Defense Service Medal and ROTC Award. He is a second year ROTC Cadet at Western Illinois University and a member of the Illinois National Guard. Hometown Hero Project Chair, Sherry Ridge shared “We are excited that Alex will be at our meeting to accept this award in person.” All heroes receive a “Hanging with the Heroes” care packages delivered with a personalized “Hanging with the Heroes” t-shirt (donated by Artrageous of Hainesville), a piece home and letters from Round Lake Area School District 116 students. The Round Lake Area Exchange Club will present a plaque to him and his family on Wednesday, September 26 at 7:30 a.m. at Panera Bread in Round Lake Beach. www.rlaexchange.org/hero, five minutes is all it takes. We look forward to announcing the October Hometown Hero. For more information visit the web site or you can contact Sherry Ridge at 847-740-2379.